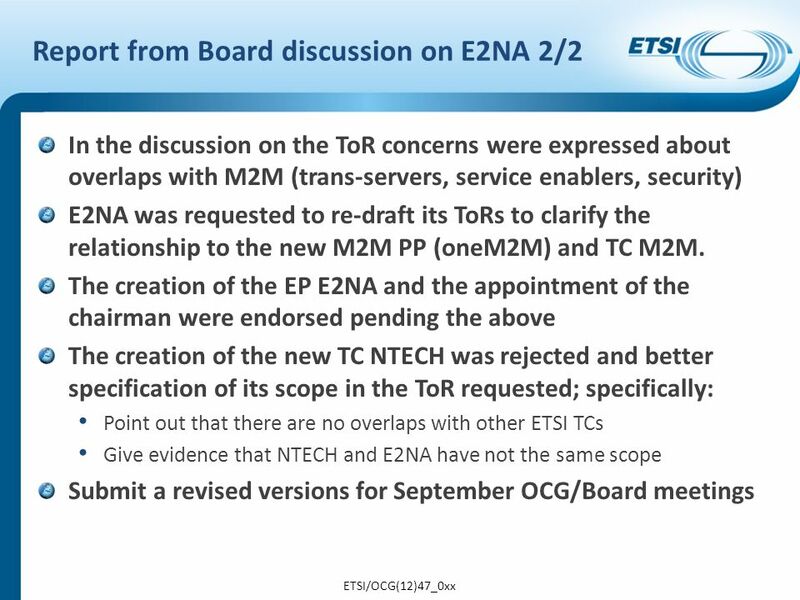 EP E2NA Report from OCG#47 and Board Doc: BoardE2NA(12)3_0xx Source: EP E2NAChair Agenda item: 2.3 For: Information © ETSI 2012. All rights reserved. 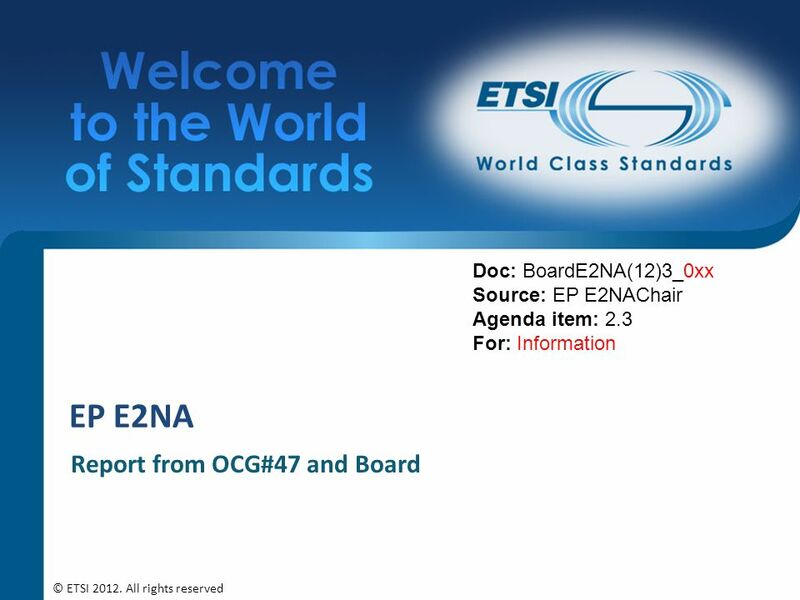 Download ppt "EP E2NA Report from OCG#47 and Board Doc: BoardE2NA(12)3_0xx Source: EP E2NAChair Agenda item: 2.3 For: Information © ETSI 2012. All rights reserved." ATTM activities Energy Consumption of ICT Equipment Dominique Roche ATTM Chairman © ETSI All rights reserved Turk Telekom - ETSI Workshop © ETSI. SEM11-06 Committee procedures ETSI Seminar © ETSI All rights reserved. SEM16-05 Maintenance & withdrawal of documents ETSI Seminar © ETSI All rights reserved. 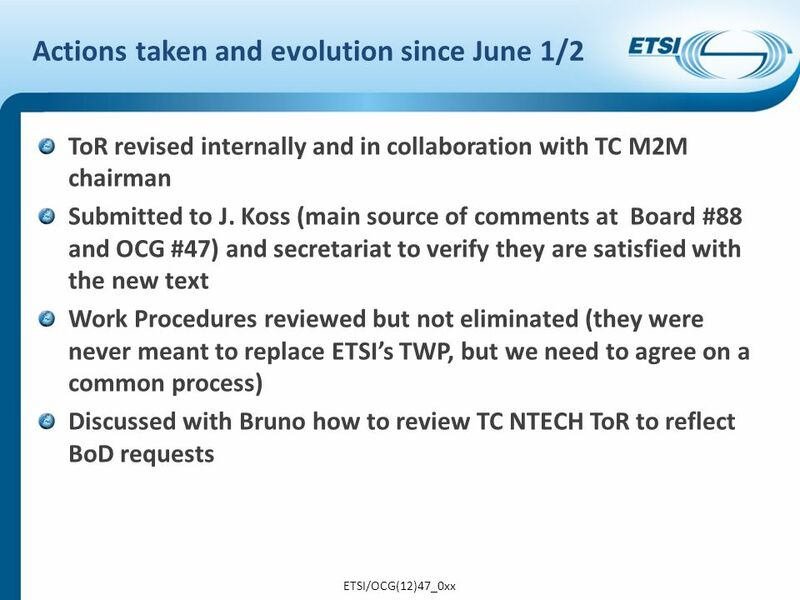 REPORT FROM OCG#50 TO BOARD#93 Doc: ETSI/BOARD(13)93_052r1 Source: OCG Chairman Agenda item: 4 For: Discussion (Late) © ETSI All rights reserved. 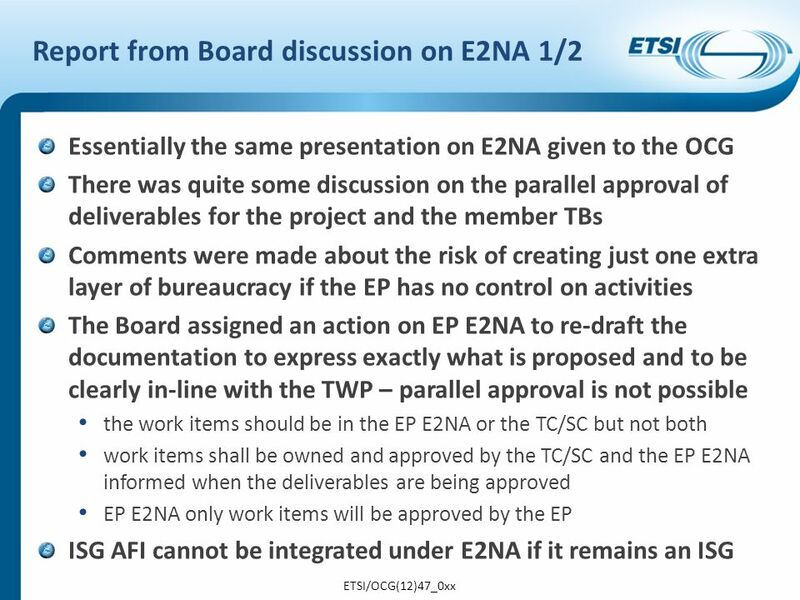 TC PLT Liaison to E2NA Doc: E2NA(13)06_008 LS_E2NA_TC_PLT Source: TC PLT Chair Agenda item: For: Info © ETSI All rights reserved. TC INT #21 SUMMARY © ETSI All rights reserved. EP E2NA Meeting # 6 –Wrap up Closing plenary notes, Jun 20, 2013 Co-Located meetings E2NA plenaries and WGs M493 #15 NTECH #3 INT #21 AFI #13 DECT #57. 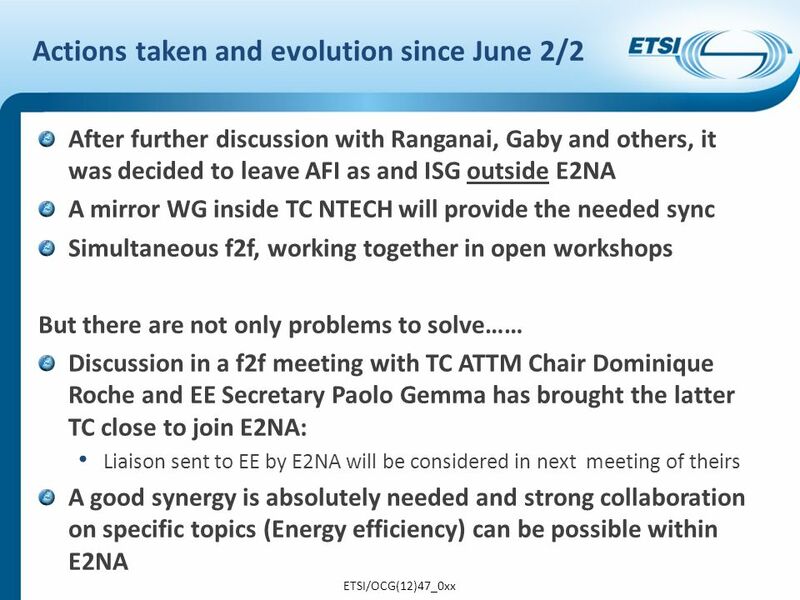 WORK ITEM REFERENCE NAMING FOR E2NA ETSI Secretariat – E2NA#03 © ETSI All rights reserved 1. Presented by: Lex de Jonge Vice-Chair CDM Executive Board Clean Development Mechanism EB perspective on recent developments, with a focus on Registration. Status summary of the ad-hoc discussions 13th of July 2012 oneM2M call. Comenius Individual Pupil Mobility. Individual Pupil Mobility Aims of the action-1  Allow secondary school pupils to spend between 3 and 10 months in. © 3GPP 2009 Mobile World Congress, Barcelona, 19 th February 2009© 3GPP GPP The Training Course / Module 10 1 All you always wanted to know about. ICANN Root Name Server System Advisory Committee March 2, 1999 SUNTEC Convention Center Singapore.